Rosie had developed a hiccup during our Mt. Washington ride. The only way I could describe it was that it seemed as though she would stall when we hit a bump, then pop-start herself again. It was very subtle with no way to demonstrate it. Alec, my mechanic when I'm home in NY, was as clueless as I was at what might be causing it. Arriving in Louisiana on Friday night, with plans to leave for Ohio on Monday morning with Skye, I unloaded Rosie from TowTow (my toyhauler). It was late so I decided to wait until morning to set up her canopy. I woke to thunder and pouring down rain! Rosie had gotten wet many times before, so I didn't think about it until I found her DEAD. Not just dead, fried! My heart sunk. Maybe I really wasn't meant to attend Summer Internationals. 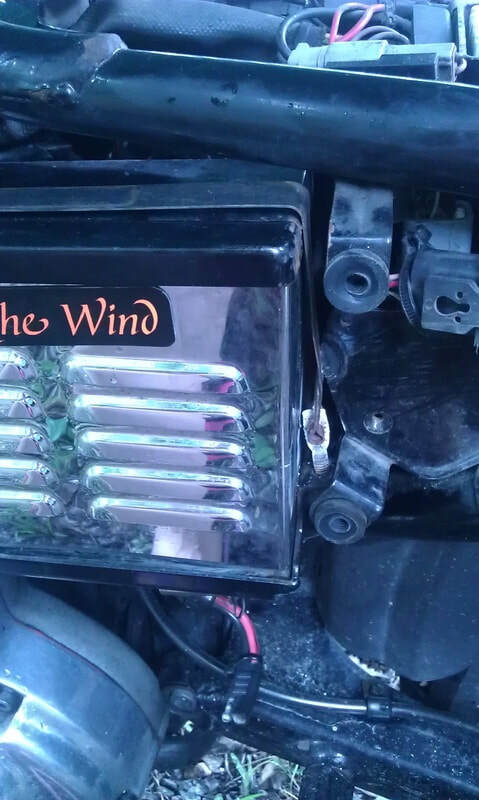 Pulling her battery revealed the cause of her hiccup; the sheathing on her positive battery cable had worn through causing a momentary short on the bumps. The short circuit fused Rosie's battery strap to her frame! The water from the downpour provided the means to complete the circuit and short out her electrical system. Her battery strap was fused to her frame, and a hole burned in her battery! Wondering if Mt. Washington was to have been her final moment of glory, I set about prying the strap loose so I could take her apart. Her book told me she has self-resetting cicuit breakers, so after taping her positive cable and battery strap, I set about finding her a new battery to see what would happen. Dannie Davis made a special trip into his shop on Sunday, only to find the reverse terminals on the battery he had. We were able to get one from Interstate Batteries on Monday. Carefully installing it to make sure there was no rub on the positive cable and that her strap didn't make contact with the frame, I held my breath as I turned her key. Lights. Ignition. Jump for joy as she popped right off! I couldn't believe her whole electrical system hadn't fried with that short!